RHRLI believes in giving patients as much information as possible. It’s one of the reasons we’re the premier hair restoration center on Long Island. Another reason for the RHRLI edge is that we have a robotic Follicular Unit Extraction (FUE) procedure that is the best permanent solution to hair loss currently available. It’s called the ARTAS® System and it uses robotic technology to find healthy donor hair and transplant it to where it’s needed. We’re the only hair transplant treatment center on Long Island that has ARTAS® and we take the time to work with our patients to design the best treatment possible. We also want to take the time to tell you how pregnancy affects hair. We mentioned above that many people have heard stories about hair growth and hair loss related to pregnancy. Which is it? Both are possible. There’s a tendency to grow hair during pregnancy and there are cases of hair loss that are related to giving birth. According to the What to Expect website, there’s a good chance that you will notice robust hair and nail growth by the 20th week of pregnancy. Why does this happen? During pregnancy, hormones like estrogen will beef up your metabolism and increase blood circulation. One of the downsides of all of this, is that you may see hair growth in places you don’t want it like your face and stomach. But this excess hair growth usually goes away within six months of giving birth. But there’s another reason why you might lose hair after giving birth, and this can be more alarming. Unlike the hair loss that occurs in the aftermath of the excessive hair growth that occurs during pregnancy, a condition called telogen effluvium can sometimes cause noticeable patches of hair loss. 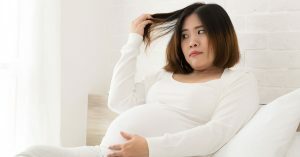 According to the American Pregnancy Association, telogen effluvium occurs when an excessive amount of your hair enters the resting phase of its growth cycle. It affects between 40 and 50 percent of women. This condition is also not permanent and the hair will grow back. In some rare cases regrowth may take a longer time. If you’re suffering from a hair loss condition that is permanent, RHRLI has the expertise to help. Our revolutionary FUE transplant is minimally invasive. You won’t need stitches or longer recovery times. You can be back to your regular life in just a few days. Contact RHRLI today.